Would the Founders and Framers Have Allowed the Son of a British “Natural Born Subject” Father and U.S. Citizen Mother To Be President and Commander in Chief of the United States in 2009? Sometimes it helps to break down a problem into its simple form in order to understand it better. Consider this. “The colonial history of Kenya dates from the Berlin Conference of 1885, when the European powers first partitioned east Africa into spheres of influence. In 1895, the British Government established the East African Protectorate and, soon after, opened the fertile highlands to white settlers. In 1920, Kenya officially became a British colony. From October 1952 to December 1959, Kenya was under a state of emergency arising from the Mau Mau rebellion against British colonial rule. Kenya became independent on December 12, 1963, and the next year joined the Commonwealth.” http://www.uiowa.edu/~africart/toc/countries/Kenya.html. Now let us apply this historical background to a factual scenario. We are in the time period after the Constitution is adopted in 1787. A man is born in a British colony as a British "natural born subject." He comes to America just to study, with the intent to return to that British colony upon completion of his studies. While in America, he impregnates an American citizen. The two then marry and have a child who, let us assume for sake of argument, is born in one of the United States in 1961. The British man then finishes his studies and goes back to his native land, leaving both his wife and son in America. The wife eventually divorces this man. Query: Would the Founders and Framers, who wanted to assure the preservation of the new constitutional republic which they built with blood, sweat, and tears shed in a war with Great Britain, and who wrote in the Constitution that after its adoption only a “natural born Citizen” is eligible to be President, have allowed the child of that British "natural born subject" father and American citizen mother to be eligible to be President and Commander in Chief of the Military in 2009? Your comments and analysis are welcomed. "The Constitution of the United States recognizes the division of the people into the two classes named by William Blackstone - natural born and naturalized citizens." Rep. Wilson Cong. Globe, 39th Cong., 1st Sess. 1116 (1866). The Constitution calls these two types of citizens, "Citizens of the United States." 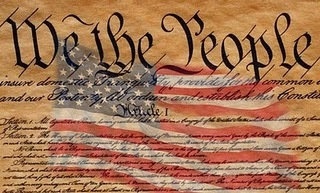 All the "Citizens of the United States" are therefore comprised of either those who Article II calls "natural born Citizens" (are not naturalized) or those which the Constitution, treaties, and Congressional Acts call “Citizens of the United States” (not being natural born must be naturalized). The "natural born Citizen" clause is nothing more than the people of the United States expressing their power of self-preservation. Hence, only a “natural born Citizen” is eligible to be President under Article II, Section 1, Clause 5. A naturalized citizen, whether naturalized "at birth" or after birth, is not so eligible. 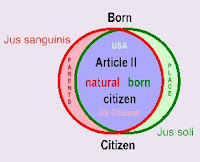 To better understand these two types of U.S. citizens (the natural born and the naturalized), I will call them "natural born Citizen of the United States, "naturalized born Citizen of the United States" (naturalized "at birth"), and "naturalized after-born Citizen of the United States" (naturalized after birth). Article I and II use the upper case "C" when writing "Citizen" and the 14th Amendment, Congressional Acts, and treaties use the lower case "c." There is no significance to the capitalization. I will use the "C" when writing the word. The first type, a naturalized "Citizen of the United States," whether "at birth" or after birth, is made, except for the first "Citizens of the United States," by positive law, to wit, the 14th Amendment, which makes "naturalized born Citizens of the United States" and which recognizes "naturalized after-born Citizens of the United States," and treaties and acts of Congress, which make "naturalized born Citizens of the United States" and "naturalized after-born Citizens of the United States" under Congress's Article I, Section 8, Clause 4 power to make uniform the laws of naturalization. The second type is a "natural born Citizen of the United States." The Framers wrote “natural born” and not just “born,” and we have to give meaning to such an additional word. By using the word “natural,” the Framers told us that this type of citizen is made by nature and not by any positive law such as the 14th Amendment, treaties, or Congressional Acts which can declare someone to be a “born” “Citizen of the United States” by law. The overwhelming majority of U.S. citizens are "natural born Citizens of the United States." If a person needs the 14th Amendment, a treaty, or Congressional act to make him or her a "Citizen of the United States," then that person cannot be a "natural born Citizen of the United States." Also, Congress could for some social or political reason attempt to enact some law denying a "natural born Citizen of the United States" that very status or attempt as it has several times already to redefine the meaning of a "natural born Citizen of the United States," but to do so would be contrary to natural law, the law of nations, and also unconstitutional. Any change to the "natural born Citizen" eligibility clause can be done only through constitutional amendment. 1. A naturalized "Citizen of the United States" so created by electing and adhering to the American Revolution. This person is among the early Presidents who were born before July 4, 1776 in the British colonies to British subject parents and therefore were born British subjects. This person is also among those who were born out of the British colonies but who either naturalized there or simply inhabited them. He or she naturalized through the effects of the Declaration of Independence and by electing to adhere to the American Revolution and by so doing the Constitution in Article I and II called him or her a “Citizen of the United States.” He or she was the first and original American citizen and he or she gained that status by transferring his or her allegiance for one foreign power to the United States during the revolution. This person was born before July 4, 1776 either in the British colonies or out of them and therefore out of the United States which had not yet existed. 2. A "naturalized born Citizen of the United States" under a Congressional Act or treaty which it calls a “citizen of the United States.” In Article I, Section 8, Section 4, the Framers gave Congress the power to naturalize persons. Hence, this citizen is created directly by the power of Congress to naturalize persons. This person, like a "naturalized born Citizen of the United States" under the 14th Amendment, is naturalized "at birth" and needs no further naturalization. This person is born abroad and has one or two U.S. citizen parents. Under a treaty, there could be other factual scenarios. Except for a naturalization act it passed in 1790 which read “natural born citizen,” but which it changed in 1795 to read “citizen of the United States, Congress has always used this power to create naturalized citizens or who it has called “citizens of the United States” “at birth” but never a "natural born Citizen of the United States." Again, this person is born out of the United States. 3. A "naturalized born Citizen of the United States" under the 14th Amendment and Congressional Act which they both call a “citizen of the United States.” This citizen is created indirectly by the power of Congress to naturalize persons which it expressed in the Civil Rights Act of 1866 and then which it constitutionalized by way of the 14th Amendment. This person is born in the United States to one or two alien parents and is born "subject to the jurisdiction of the United States." This person is naturalized at birth and needs no further naturalization. 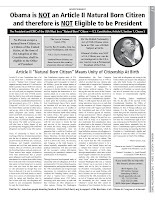 The explicit text of the Fourteenth Amendment declares these persons to be "citizens of the United States," not "natural born Citizens.” The text of the amendment itself tells us that its purpose is not to create “natural born Citizens,” but rather “citizens of the United States” which we know from other articles of the Constitution and Congressional Acts include naturalized citizens either at birth or after birth. Article II, Section 1, Clause 5, through the grandfather clause, explicitly tells us that just being a “citizen of the United States” is no longer sufficient to be eligible to be President for those children born after adoption of the Constitution. The only reason that the Framers could have had for this disqualification is that they considered those "citizens of the United States" who were not "natural born Citizens" to be naturalized either at birth or after birth. Every constitutional amendment has its own meaning and value and must be interpreted and understood in light of the purpose for which it was passed. The 14th Amendment was not passed to amend the meaning of an Article II "natural born Citizen." Rather, it was passed to allow those who were born in the United States subject to its jurisdiction and who could not become "natural born Citizens" or even "citizens of the United States"-- because having been born to parents who were themselves not considered to be "natural born Citizens" or even "citizens of the United States" even though born in the United States and subject to its jurisdiction or who under our naturalization laws could not even become naturalized citizens of the United States--to become "citizens of the United States." We recognize that persons can be naturalized at birth by treaties and Congressional Acts. There is no legal impediment in concluding that a constitutional amendment can have the same naturalizing effect as a treaty or Congressional Act in matters of citizenship. We have evidence in the Congressional debates on the Civil Rights Act that the Act's intended effect was to naturalize persons "born in this country." In the Congressional debates on the Civil Rights Act, Senator Edgar Cowan "ask[ed] whether [the Act] will not have the effect of naturalizing the children of Chinese and Gypsies born in this country?" Senator Lyman Trumbull replied: "Undoubtedly. . . . [T]he children of an Asiatic is just as much a citizen as the child of a European." Cong. Globe, 39th Cong., 1st Sess. 498. Indeed, Congress proposed the 14th Amendment and it was passed to ensure the Act's validity and indefinite survival. That this Congressional Act was elevated to constitutional status by the 14th Amendment does not change the fact that this type of citizenship is granted by operation of positive law rather than by nature. After all, the Constitution did not make the citizens. Rather, the citizens made the Constitution. The 14th Amendment, regarding children born in the United States, and given current interpretation of the "subject to the jurisdiction thereof" clause, did nothing more than amend our naturalization laws and extend naturalization at birth to children born in the United States to alien parents. Congress has even confirmed its power to naturalizing one born in the United States through 8 U.S.C. Section 1401(a) and (b). Hence, the amendment did no more than allow these persons to become members of American society by naturalizing them at birth. Vattel recognized this type of “at birth” naturalized citizen when he stated: “Finally, there are states, as, for instance, England, where the single circumstance of being born in the country naturalises the children of a foreigner.” Emer de Vattel’s The Law of Nations, or Principles of the Laws of Nature, Applied to the Conduct and Affairs of Nations and Sovereigns, bk. 1, c. 19, sec. 214 (original French in 1758 and first English in 1759, and other subsequent French and English editions). Minor v. Happersett, said: "Additions might always be made to the citizenship of the United States in two ways: first, by birth, and second, by naturalization. This is apparent from the Constitution itself, for it provides that ‘no person except a natural-born citizen, or a citizen of the United States at the time of the adoption of the Constitution, shall be eligible to the office of President,’ and that Congress shall have power ‘to establish a uniform rule of naturalization.’ Thus new citizens may be born or they may be created by naturalization" (footnotes omitted). Minor v. Happersett, 21 Wall. 162, 166-168 (1874). It also does not matter that one is considered a "naturalized born Citizen of the United States" under the Fourteenth Amendment or an Article II “natural born Citizen of the United States,” for these citizens enjoy equal rights, except that only the latter has the privilege of being eligible to be President. This person could be putative President Obama, who was born to a U.S. citizen mother and a British father, if he was born in Hawaii, a fact which he has yet to conclusively prove. This is also Governor Bobby Jindal, who was born in the United States to a non-U.S. citizen father and mother. He was naturalized at birth under the 14th Amendment and needed no further naturalization. Again, this person is born in the United States. 4. A "naturalized after-born Citizen of the United States" under a Congressional Act or treaty which the 14th Amendment in 1868 confirmed to be a “citizen of the United States.” This citizen is created directly by the power of Congress to naturalize persons. This person is born out of the United States to two alien parents and is naturalized in the United States after birth. Before the 14th Amendment was passed, this person was also born in the United States to alien parents and also naturalized after birth. Hence, before the 14th Amendment, this person was born either in the United States or out of it. If born in the United States and a minor, he or she naturalized when his or her father naturalized, or on his or her own right if an adult. Since the 14th Amendment, this person is born out of the United States. Since this person is not naturalized at birth, he or she needs naturalization after birth. This type of citizen includes Governor Arnold Schwarzenegger who was born in Austria to a non-U.S. citizen father and mother and who naturalized in the United States after birth under a Congressional Act. There is only one definition of a "natural born Citizen of the United States." This definition has never changed since the writing of the Constitution. This definition is a child born in the United States (or its equivalent) to a father and mother who are both either “natural born Citizens of the United States” or naturalized “citizens of the United States.” Emer de Vattel’s The Law of Nations, or Principles of the Laws of Nature, Applied to the Conduct and Affairs of Nations and Sovereigns, bk. 1, c. 19, sec. 212 (original French in 1758 and first English in 1759, and other subsequent French and English editions) (“The natives, or natural-born citizens, are those born in the country, of parents who are citizens.”); David Ramsay, A Dissertation on the Manners of Acquiring the Character and Privileges of a Citizen (1789) (concerning the children born after the Declaration of Independence, “[c]itizenship is the inheritance of the children of those who have taken part in the late revolution; but this is confined exclusively to the children of those who were themselves citizens….” Id. at 6; “citizenship by inheritance belongs to none but the children of those Americans, who, having survived the declaration of independence, acquired that adventitious character in their own right, and transmitted it to their offspring….” Id. at 7; citizenship “as a natural right, belongs to none but those who have been born of citizens since the 4th of July, 1776….” Id. at 6); The Naturalization Act of 1790 and 1795 (in both acts early Congresses provided that, regardless of whether the child was born in or out of the United States, any child born to alien parents who later naturalized before the child reached twenty-one years of age was derivatively naturalized at the time of their parents' naturalization and thus "considered as "citizens of the United States," and thereby left out of such need for naturalization only children born in the United States to citizen parents); The Venus, 12 U.S. (8 Cranch) 253, 289 (1814) (Chief Justice John Marshall, concurring and dissenting for other reasons, cited Vattel and provided his definition of natural born citizens, stated “The natives or indigenes are those born in the country of parents who are citizens.”); Speaker of the House of Representatives, Langdon Cheves (1814) (“The children have a natural attachment to the society in which they are born: being obliged to acknowledge the protection it has granted to their fathers, they are obliged to it in a great measure for their birth and education. … We have just observed that they have a right to enter into the society of which their fathers were members. But every man born free, the son of a citizen, arrived at years of discretion, may examine whether it be convenient for him to join in the society for which he was destined by his birth); Inglis v. Sailors’ Snug Harbor, 28 U.S. 99, 3 Pet. 99, 7 L.Ed. 617 (1830) (a majority of the Court which included Chief Justice John Marshall found on principles consistent with Vattel’s jus sanguinis and not on the English common law rule of jus soli, that simply being born in New York, after July 4, 1776 and before September 15, 1776, when the British took possession of New York, was not sufficient to establish one’s status as an American citizen, for a child of minor years is incapacitated from making any citizenship election but rather followed the citizenship held or chosen by the father); Massachusetts and South Carolina, The New Englander, Vol. III, 413-414, 434-435 (1845). ("The expression 'citizen of the United States' occurs in the clauses prescribing qualifications for Representatives, for Senators, and for President. In the latter, the term ' natural born citizen' is used, and excludes all persons owing allegiance by birth to foreign states; in the other cases, the word 'citizen' is used without the adjective, and excludes persons owing allegiance to foreign states, unless naturalized under our laws. The discussions in the convention furnish no indication that there was any other distinction present in the minds of its members. (*Judge Washington, See 4 Wash. Circuit Court Reports, 516). . . . It is the very essence of the condition of a natural born citizen, of one who is a member of the state by birth within and under it, that his rights are not derived from the mere will of the state. For the state and the citizen spring at once and together from the ordinance of nature, and from this natural relation between them result the essential rights and essential duties of both. The highest and most solemn enactment, even the fundamental, organic law of a state, does not by its proper force as positive law create, but only acknowledges this relationship”); Dred Scott v. Sandford, 60 U.S. (19 How.) 393 (1857) (Daniels, J. concurring) (cited and quoted Vattel and said: “The natives, or natural-born citizens, are those born in the country, of parents who are citizens”); Minor v. Happersett, 88 U.S. 162, 167-68 (1875) (provided the same Vattel definition without citing Vattel, stated: “all children born in a country of parents who were its citizens became themselves, upon their birth, citizens also. These were natives or natural-born citizens, as distinguished from aliens or foreigners”); Ex parte Reynolds, 20 F.Cas. 582, 5 Dill. 394, No. 11,719 (C.C.W.D.Ark 1879) (provided the same Vattelian definition and cited Vattel); United States v. Ward, 42 F.320 (C.C.S.D.Cal. 1890) (provided the same Vattelian definition and cited Vattel); and U.S. v. Wong Kim Ark, 169 U.S. 649 (1898) (quoted the same definition of “natural born Citizen” as did Minor v. Happersett); Alexander Porter Morse, Natural-Born Citizen Of The United States: Eligibility For The Office Of President, Albany Law Journal Vol. 66 (1904-1905) (“Those resident in the United States at the time the Constitution was adopted were made citizens. Thereafter the president must be taken from the natural-born citizens. If it was intended that anybody who was a citizen by birth should be eligible, it would only have been necessary to say, “no person, except a native-born citizen”; but the framers thought it wise, in view of the probable influx of European immigration, to provide that the president should at least be the child of citizens owing allegiance to the United States at the time of his birth”); Breckenridge Long, Is Mr. Charles Evans Hughes a “Natural Born Citizen” Within the Meaning of the Constitution?” Chicago Legal News, Vol. 146, p. 220 (1916) (there is a distinction between a “native born” and “natural born;” a “citizen of the United States” is not the same as a “natural born Citizen;” a “natural born Citizen” is one made by the laws of nature and not by operation of law and from the moment of birth owes allegiance exclusively to the United States; a person who is born with dual or conflicting allegiances and citizenships, naturally caused by being born in the country to an alien father which causes the person to acquire one allegiance and citizenship by jus soli and the other by jus sanguinis, respectively, which birth circumstance causes a foreign power to be able to lay a claim of allegiance or jurisdiction over that person, cannot be a “natural born Citizen;” a child born in the United States to an alien father may become a “citizen of the United States” by becoming a citizen by naturalization either upon his father naturalizing before the child reaches majority or through his own naturalization application thereafter); and Perkins v. Elg, 307 U.S. 325 (1939) (the Supreme Court declared a child who was born in the United States to citizen parents a “natural born citizen”). If one satisfies the definition of a “natural born Citizen of the United States,” that person will have natural unity of citizenship and sole allegiance to the United States. The overwhelming majority of citizens are "natural born Citizens of the United States." One cannot be a "natural born Citizen of the United States" if he or she at most falls into one of the naturalized categories listed above (naturalized at birth or after birth) and therefore fails to meet the definition of a "natural born Citizen of the United States." In fact, the text of the Amendment itself uses the phrase “citizen of the United States” and not “natural born Citizen.” We know from the grandfather clause in Article II, Section 1, Clause 5 that a “Citizen of the United States” who was not a “natural born Citizen” was a naturalized citizen and only eligible to be President if born before the adoption of the Constitution. For births after the adoption of the Constitution, the Framers did not allow a naturalized citizen to be eligible to be President. Hence, one is required to be a “natural born Citizen” under the Constitution only if one is born after the adoption of the Constitution and one wants to be President or Vice President. Congress only has the power to naturalize. The Constitution does not give Congress any power to create a "natural born Citizen of the United States." Under the Constitution, Congress has no power over this person's citizenship status because he or she is born in the country to citizen parents all of which makes him or her a "natural born Citizen of the United States." If we accept that natural law and the law of nations prescribe that being born in a foreign country to U.S. citizen parents (who were “natural born Citizens of the United States” or “naturalized Citizens of the United States”) serving the armies of the state is the equivalent to being born in the United States, this is John McCain because he was born to a U.S. citizen father and mother who were in Panama serving the armies of the United States. Emer de Vattel’s The Law of Nations, or Principles of the Laws of Nature, Applied to the Conduct and Affairs of Nations and Sovereigns, bk. 1, c. 19, sec. 217. This cannot be Mr. Obama because even though he might be born in Hawaii (which he has yet to conclusively prove), he was born to a British father who by right of descent under the British Nationality Act of 1948 passed his British citizenship to his son, Mr. Obama, who consequently was also born a British citizen. So Obama’s foreign natural birth allegiance is compounded by his father being a British subject when Obama was born and he also being born a British citizen. At age 2, Mr. Obama even became a citizen of Kenya whose citizenship he retained to at least the age of 23. The Founders and Framers simply would not accept a person born with such foreign natural allegiance to be an Article II “natural born Citizen” and eligible to occupy the singular and all-powerful Office of the President and Commander in Chief of the Military. Finally, as we have seen, Obama’s ineligibility to be President is dictated not by foreign law but rather by U.S. common law grounded on natural law and the law of nations. 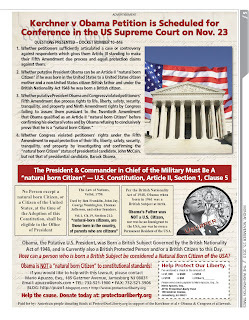 If Obama were born in the U.S. to citizen parents, U.S. common law--natural law and the law of nations which several U.S. Supreme Court cases have made a part of the law of the land and controlling on the question of national citizenship--would apply to the fullest extent, making him a "natural born Citizen of the United States." 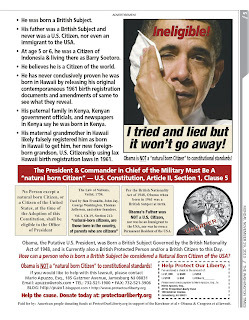 If Obama were born in the U.S. to a non-citizen father and U.S. citizen mother, U.S. law would again apply, making him a "naturalized born Citizen of the United States" under the 14th Amendment and Congressional Act. He cannot be an Article II "natural born Citizen of the United States" under U.S. common law because his father was not a U.S. citizen but rather a British citizen under the British Nationality Act of 1948, and Obama himself was born a British citizen under that same act. Given his birth circumstances (assuming he was born in the U.S.), Obama can only rely upon the 14th Amendment, an expression of Congress's naturalization power incorporated into the Constitution (like Wong Kim Ark), or a Congressional Act for U.S. citizenship which means that he is a "naturalized born Citizen of the United States" (a "Citizen of the United States" who is naturalized "at birth") but not a "natural born Citizen of the United States" which needs no law to create. Not being a "natural born Citizen of the United States," Obama is not and cannot be eligible to be President and Commander in Chief of the Military. 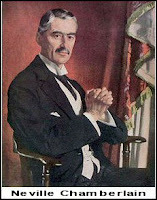 The "Roberts Court" of the U.S. Supreme Court in my opinion will be known in history as the "Neville Chamberlain Supreme Court", the great Obama appeaser court. Appeasement due to fear that some immediate small amount of veiled and threatened violence from the far left socialists and Saul Alinsky goons, tyrants and bullies, and thus not doing the right thing early on to support the rule of law and the Constitution, ultimately leads to much bigger problems later. History has shown us that over and over. The Obama eligibility matter should have been fully and thoroughly addressed and openly investigated by the investigative reporters in the major media and political parties early in the spring of 2008 during the primaries to get all of Obama's documents released to the public as part of the vetting process. It wasn't done. Congress should have addressed this when asked by 100s of thousands of constituent letters and petitions sent to them and when constitutionally it was required to so under the 20th Amendment. It didn't. The courts should have addressed the merits of the questions when appealed to early on. They didn't. Everyone in our system of government chose ignoring the problem and appeasement over confrontation and punted the ball to someone else. Now it is far worse. The Supreme Court has chosen appeasement and inaction over action and dealing with the issue and questions openly in a court of law under the rules of evidence and law. Our constitutional republic and legal system is now compromised and broken top to bottom and bottom to top. And it will only get worse as our legal system and constitutional republic further deteriorates and the rule of law gives way more and more to appeasement of bullies and tyrants in waiting such as Obama and his far left Marxist cronies and puppet masters. Appeasement of the constitutional usurpers will not make it go away. It will only delay the inevitable and fester and grow and in the end be a far worse situation to deal with when the real nature of the tyrant reveals himself in a much bolder way and attempts to take away all our protections to our unalienable rights and liberty. Neville Chamberlain tactics never work with bullies, alinskyites, tyrants, and national socialists. The U.S. Supreme Court orders were posted at 10:00 a.m. on 29 Nov 2010. See below. Certiorari for our case was denied. The two justices appointed by Obama who in my opinion had a direct financial conflict of interest (their very jobs and appointments to the court) in the outcome of this petition and case did not recuse themselves even though they should have! Their recusal was called for in our petition on page 36 with the relevant U.S. Code cited. The two justices and the court ignored that. There were recusals declared by these two Obama appointees in many other petitions including the one immediately before our petition in the orders list and the one immediately after. Imo, apparently the court needed all nine justices in the room to kill the petition. With the full court of 9 justices it's the rule/vote of 4 to grant certiorari to move the case forward. With two recusals that would have left only 7 justices and it's then the rule/vote of 3 to grant certiorari to move the case forward. I suspect the water cooler buzz at SCOTUS was that 3 justices were leaning for granting certiorari. So it looks like Sotomayer and Kagan ignored ethical considerations and stayed in the review of the petition to be sure it got killed, i.e., to be in that room to argue against Certiorari, and to require 4 votes to grant cert instead of 3 ... financial conflict of interest and ethics be damned by those two justices. JMHO. U.S. Supreme Court orders were posted at 10:00 a.m. on 29 Nov 2010. See below. Certiorari for our case was denied. The two justices appointed by Obama who had in my opinion a direct financial conflict of interest (their very jobs and appointments to the court) in the outcome of this petition and case did not recuse themselves even though they should have! Their recusal was called for in our petition on page 36 with relevant U.S. Code cited. The two justices and the court ignored that. There were recusals declared by these two Obama appointees in many other petitions including the one immediately before our petition in the orders list and the one immediately after. Imo, apparently the court needed all nine justices in the room to kill the petition. With the full court of 9 justices it's the rule/vote of 4 to grant certiorari to move the case forward. With two recusals that would have left only 7 justices and it's then the rule/vote of 3 to grant certiorari to move the case forward. I suspect the water cooler buzz at SCOTUS was that 3 justices were leaning for granting certiorari. So it looks like Sotomayer and Kagan ignored ethical considerations and stayed in the review of the petition to be sure it got killed, i.e., to be in that room to argue against Certiorari, and to require 4 votes to grant cert instead of 3 ... financial conflict of interest and ethics be damned by those two justices. JMHO. Supreme Court Orders Will be Posted Here at 10 a.m.
We are living through history in the making. Please read or re-read this historic Petition to the U.S. Supreme Court asking them to support and defend the Constitution ... in particular Article II, Section 1, Clause 5, the presidential constitutional eligibility clause. Read or re-read the Petition then read this ad. Then meditate on the words in both and then pray that the Justices do the right thing on Tuesday and support and defend our Constitution and Republic and grant Certiorari and take up our case and seek the truth about Mr. Obama the usurper, impostor, and fraud now occupying the Oval Office. Mr. Obama and his puppet masters and his enablers in political power and in the main stream media have perpetrated and allowed to continue the greatest fraud on this nation in the history of our Republic and he needs to be exposed and removed. See the ad linked to below and via the image at the left for an overview of the Petition and the issues. 1. Whether petitioners sufficiently articulated a case or controversy against respondents which gives them Article III standing to make their Fifth Amendment due process and equal protection claims against them. 2. Whether putative President Obama can be an Article II “natural born Citizen” if he was born in the United States to a United States citizen mother and a non-United States citizen British father and under the British Nationality Act 1948 he was born a British citizen. 4. Whether Congress violated petitioners’ rights under the Fifth Amendment to equal protection of their life, liberty, safety, security, tranquility, and property by investigating and confirming the “natural born Citizen” status of presidential candidate, John McCain, but not that of presidential candidate, Barack Obama. History shows us that a popularly elected, but ineligible, chief executive in the executive branch of a government can be legally and constitutionally removed from office, e.g., Governor Thomas H. Moodie of North Dakota was a prime example. After he was sworn in and serving as Governor, the North Dakota State Supreme Court ordered Governor Moodie removed from office, after it was determined that he was constitutionally and legally ineligible to serve in the office to which he was popularly elected. Thus it is very clear that winning a popular election does not trump or nullify the constitution of a state or the U.S. federal constitution. Obama is not constitutionally eligible to be the President and Command in Chief of the military and should be removed from office and his election, confirmation, and swearing in annulled. Again, please take the time to read or re-read the Petition then read this ad. The questions and the main brief are only 36 succinctly written and easy to read pages. Then meditate on the words therein and then pray that the Justices do the right thing on Tuesday and support and defend our Constitution and Republic and grant Certiorari and take up our case and seek the truth about Mr. Obama the usurper, impostor, and fraud now occupying the Oval Office. Mr. Obama and his puppet masters and his enablers in political power and in the main stream media have perpetrated and allowed to continue the greatest fraud on this nation in the history of our Republic and he needs to be exposed and removed. May God help us save our liberty and republic and protect us in the days ahead. Thus it is very clear that winning a popular election does not trump, amend, or nullify the constitution of a state or the U.S. federal constitution. We are a nation of laws, not men. We are a constitutional republic, not a pure democracy where the current political whims of the the political majority can over rule the U.S. Constitution by a simple popular vote. Obama is not constitutionally eligible to be the President and Command in Chief of the military and should be removed from office and his election, confirmation, and swearing in annulled. Through historical development, unity of citizenship and sole allegiance at birth is not required for U.S. born citizen Senators, Representatives, and regular citizens under the 14th Amendment and Congressional enactments. In contradiction and which confirms the Founding Fathers' meaning of what a "natural born Citizen" is, naturalized citizens, since 1795, before becoming such must swear an oath that they renounce all other allegiances to other nations. 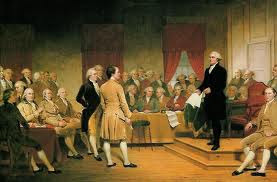 During the Washington Administration, the First Congress passed the Naturalization Act of 1795 in which it provided that new citizens take a solemn oath to support the Constitution and “renounce” all “allegiance” to their former political regimes. This is during the time that most of the Framers were alive and still actively involved in guiding and forming the new national government and Constitutional Republic. Today, we still require that an alien upon being naturalized must give an oath that he/she renounces all former allegiances and that he/she will “support and defend the Constitution and laws of the United States of America against all enemies, foreign and domestic.” Hence, allegiance is not simply a thing of the past but very much with us today. It is important to also understand that naturalization takes an alien back to the moment of birth and by law changes that alien’s birth status. In other words, naturalization, which by legal definition requires sole allegiance to the United States, re-creates the individual as though he were a born Citizen but only does it by law and not by nature. This is the reason that the 14th Amendment considers a naturalized person to be a “citizen” of the United States and not a “natural born Citizen” of the United States. This recreation of birth status through naturalization which also existed under English common law also probably explains why John Jay underlined the word “born” when he recommended to General Washington that only a “natural born Citizen” (as to say born in fact, by nature, and not by law) be allowed to be President. Consequently, naturalized citizens stand on an equal footing with born Citizens (who are so recognized and confirmed by the 14th Amendment or by an Act of Congress and who can be but not necessarily are also “natural born Citizens”) except that they cannot be President or Vice President, for they were born with an allegiance not owing to the United States and acquire that sole allegiance to the United States only after birth. Surely, if a naturalized citizen, even though having sole allegiance to the United States, is not Constitutionally eligible to be President, we cannot expect any less of someone who we are willing to declare so Constitutionally eligible. Atty Mario Apuzzo and CDR Charles Kerchner (Ret) will be guests on the Revolution Radio Show hosted by Dr. Kate on Wednesday, 17 Nov 2010, at 9:00 p.m. EST. The subject will be the latest news about the Kerchner et al v Obama & Congress et al lawsuit and Petition filing at the U.S. Supreme Court including review of the four questions presented in the Petition. Two Justices, Sotomayer and Kagan, have been requested in the Petition to recuse themselves from this case in that they have a direct financial conflict of interest in the outcome of this case, i.e., their very appointments to the court were made by Obama. We have also asked the Justices in our Petition to take judicial notice of the Lt Col Lakin court martial in process and the Affidavit filed in that military trial by Lt Gen McInerney as to the impact that the uncertainty of the constitutional eligibility of Obama is having on our military whose members have all sworn an oath to support and defend the Constitution against all enemies foreign and domestic. Recent activity in the case includes an Amicus Curiae Brief which was filed by the Western Center of Journalism in support of the Kerchner et al v Obama et al Petition for Writ of Certiorari before the U.S. Supreme Court. The uncovering and initial release to the public by this blog on 5 Nov 2010 of the Congressional Research Service (CRS) internal memorandum to members of Congress will also be discussed. Atty Mario Apuzzo & Mr Donald Nelsen, one of the four plaintiffs in the Kerchner et al v Obama & Congress et al lawsuit, were guests on the Howie Mandel Radio Show hosted by Jim 'Howie' Mandel - Tues 16 Nov 2010, 4:00 p.m. EST. The subject was the latest news about the Kerchner et al v Obama & Congress et al lawsuit and Petition filing at the U.S. Supreme Court and the latest activity in that case including an Amicus Curiae Brief filed by the Western Center of Journalism in support of the Kerchner et al v Obama et al Petition for Writ of Certiorari before the U.S. Supreme Court. Atty Mario Apuzzo and CDR Kerchner were featured guests on the Les Naiman radio show, WGTK 970 in Louisville KY, hosted by Les Naiman, on Sunday, 14 November 2010, 6 PM EST. The subject will be the status of the Kerchner et al v Obama & Congress et al lawsuit which is currently on Petition for Writ of Certiorari at the U.S. Supreme Court, docket number 10-446. 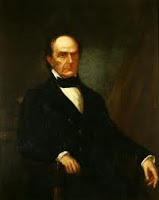 Daniel Webster, known as the "Defender of the Constitution," was a famous orator and statesman. He argued cases before the U.S. Supreme Court, served as a U.S. Congressman, a U.S. Senator, and U.S. Secretary of State. In 1820, what later became known as the State of Maine separated from the Commonwealth of Massachusetts. This development caused the Commonwealth to seek to amend its constitution of 1780. The Commonwealth chose delegates to meet in convention for the purpose of amending its constitution. The town of Boston chose Mr. Webster as one of its delegates. "Two questions naturally present themselves. In the first place, Have the people a right, if in their judgment the security of their government and its due administration demand it, to require a declaration of belief in the Christian religion as a qualification or condition of office? On this question, a majority of the committee held a decided opinion. They thought the people had such a right. By the fundamental principle of popular and elective governments, all office is in the free gift of the people. They may grant or they may withhold it at pleasure; and if it be for them, and them only, to decide whether they will grant office, it is for them to decide, also, on what terms and what conditions they will grant it. Nothing is more unfounded than the notion that any man has a right to an office. This must depend on the choice of others, and consequently upon the opinions of others, in relation to his fitness and qualification for office. No man can be said to have a right to that which others may withhold from him at pleasure. There are certain rights, no doubt, which the whole people, or the government as representing the whole people, owe to each individual in return for that obedience and personal service, and those proportionate contributions to the public burdens which each individual owes to the government. These rights are stated with sufficient accuracy, in the tenth article of the Bill of Rights, in this constitution. " Each individual in society has a right to be protected by it in the enjoyment of his life, liberty, and property, according to the standing laws." Here is no right of office enumerated; no right of governing others, or of bearing rule in the State. All bestowment of office remaining in the discretion of the people, they have of course a right to regulate it by any rules which they may deem expedient. Hence the people, by their constitution, prescribe certain qualifications for office respecting age, property, residence, and taxation. But if office, merely as such, were a right which each individual under the social compact was entitled to claim, all these qualifications would be excluded. Acknowledged rights are not subject, and ought not to be subject to any such limitation. The right of being protected in life, liberty, and estate is due to all and cannot be justly denied to any, whatever be their age, property, or residence in the State. These qualifications, then, can only be made requisite as conditions for office on the ground that office is not what any man can demand as matter of right but rests in the confidence and good-will of those who are to bestow it. In short, it seems to me too plain to be questioned that the right of office is a matter of discretion and option, and can never be claimed by any man on the ground of obligation. It would seem to follow, then, that those who confer office may annex any such conditions to it as they think proper. If they prefer one man to another, they may act on that preference. If they regard certain personal qualifications, they may act accordingly, and ground of complaint is given to nobody. . . .
Now, if the people may, without injustice, act upon this preference, and from a sole regard to this qualification, and refuse in any instance to depart from it, they have an equally clear right to prescribe this qualification beforehand as a rule for their future government. If they may do it, they may agree to do it. If they deem it necessary, they may so say beforehand. If the public will may require this qualification at every election as it occurs, the public will may declare itself beforehand and make such qualification a standing requisite. That cannot be an unjust rule, the compliance with which, in every case, would be right. This qualification has nothing to do with any man's conscience. If he dislike the condition, he may decline the office in like manner as if he dislike the salary, the rank, or any thing else which the law attaches to it. " Indeed, Webster expresses an opinion that, under a government characterized by popular and elective office, the People have a right to establish qualifications for their elected officials before they may occupy any such office, for such office is “the free gift of the people.” He explains that no man has a right to an office, for the office is granted at the pleasure of the People to those in whom they feel “confidence” and with whom they share a feeling of “good-will” because they believe that person to be both fit and qualified for that office. He adds that the same People can decide at their “discretion and option” to change those qualifications as they deem necessary for their own safety and security. Mr. Webster then explains how each individual has a personal right to receive protection from his or her government. Mr. Webster explains that each individual in society has in accordance with a legal process a personal right to be protected by the whole People represented by his or her government in his or her life, liberty, and property in exchange for which the individual grants to the whole People and its representative government his or her obedience and personal service. He states that this right to protection “is due to all and cannot be justly denied to any” whatever their condition. He also explains that qualifications for office are for the safety and security of the individual and the nation as a whole. He believes that such qualifications should be retained in the constitution agreed upon by the People so as to provide to them the maximum protection. 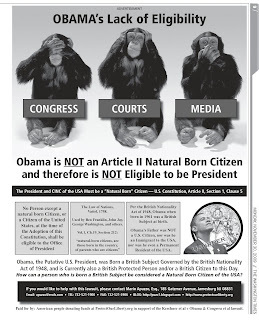 This is the same argument that I have made before the U.S. Supreme Court to show that the Kerchner petitioners have standing to pursue their constitutional claims against Obama, Congress, Pelosi, and Cheney, claims in which they demand that Obama conclusively show that he is an Article II “natural born Citizen.” Petitioners have a right to demand that only a person who is a “natural born Citizen” occupy the Office of President and Commander in Chief of the Military. As Mr. Webster explains, it is the Kerchner petitioners personal right to demand it, for the Constitution has decreed it for the benefit of protecting the life, liberty, safety, security, tranquility, and property of every individual making up the People. Indeed, Obama has no right to the Office of President and Commander in Chief. He can only occupy that office at the pleasure, discretion, and option of the People which includes the Kerchner petitioners. And the Kerchner petitioners, showing that both Congress and the Executive have failed to protect them and their individual rights guaranteed to them under the U.S. Constitution and in their effort to therefore protect themselves, have every right to take their claims to a court of law for the purpose of enforcing their personal and individual right to that protection.